Author jjackson42Posted on July 25, 2018 Format QuoteLeave a comment on Tuesday Talk catches up with writer John Jackson and chats about writing, desert island ‘must haves’ and…hedgehogs. Cornwall is firmly linked in my childhood memories as THE place we went to on holiday. My Grandmother and Great-Grandmother bought a tiny fisherman’s cottage in St. Ives for £200 in 1948 after my Grandfather had died. Every summer we would drive down from south Manchester, long, long before motorways existed. We would start at 5 in the morning and stop for a picnic breakfast on the A36 outside Gloucester, then Bath and the south-west, arriving as dusk fell. At that age, the journey was part of the holiday, although we always stopped at the same places through the day. I’ll gloss over the time my parents left me in my portable high chair, hanging from a farm gate. (they realized I wasn’t in the car after about 100 yards). The A30 going into Cornwall was no better then than now! The road was slower, but the traffic was a lot lighter. There were some famous bottlenecks along the way; some of them are still there, re-designated as “road improvements”. Holidays in St Ives were one long beach day after another. Porthminster, Porthmeor, Westcott’s Quay, the Harbour. A family of four can’t fit in a tiny cottage, so half the family would decamp to stay with my uncle and aunt at their farm in Leedstown. A real old-style small Cornish mixed farm where my Aunt and uncle ran a herd of Channel Island cows, kept pigs and raised chickens. I still remember the year my uncle got a tractor! It was Dobbin the horse before that. Just after the War, there were still fields being cut by scythe by a gang of miners when they came off shift. The farm had no electricity then, so taking a candle to bed was a real adventure. My Uncle, Ralph Harvey James, came from a long line of Cornishmen, and his grandfather was the last Purser of the Botallack mine on Cape Cornwall. Of course, when you are aged six, summers lasted forever, and the sun always shone. I have no memory at all of it raining! It seems we only remember the good times at that age. A couple of years ago, we started holidaying in Cornwall again. While the family members are long gone, the magic still remains. Perhaps with all that history, it was inevitable I would fall into writing historical romance. There is a book coming eventually featuring the Harvey James family! John’s first historical novel, Heart of Stone, was published in October 2017 by Crooked Cat Press. Set in Ireland, and about more of John’s ancestors, it continues to garner 5* reviews. 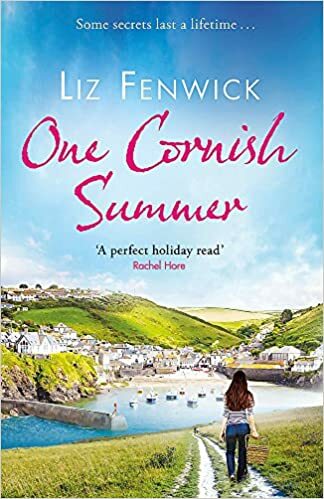 Find out more at www.lizfenwick.com, follow her on Twitter @liz_fenwick or visit her Facebook page @liz.fenwick.author. And, from today, in bookshops everywhere! On NOT Winning the Joan Hessayon Award. First and foremost, this is SO much NOT A MOAN! The delightful Hannah Begbie duly won for “Mother” and spoke very movingly on accepting the award. I’ve already pre-ordered “Mother” and will be reading it as soon as it comes out in August. But, for me – we were ALL winners on the night. I would say to all those on the New Writers Scheme, YOUR turn will come. You will get published sooner or later, and when you do, you too will be up for the Joan Hessayon Award. This is, of course, both this year’s winner, Hannah, and last years winner, Kate Field. Those who were there will long remember their speeches. Both moving and affecting; they touched a chord in all of us. Speaking personally, being in Oxford for the Award Ceremony – as well as the Summer Party, crowned a super year for me. It “set the seal” on the year, and to get the public recognition from my peers (peeresses?) in the RNA. A key life moment, I think, at least as far as my career as an author goes. There were four of us who are published by Crooked Cat at the party, and three of us up for the Joan Hessayon. Me, Sarah Stevenson, Awen Thornber and Lynn Forth. Oxford was memorable in so many ways. While not so accessible for some, to have it in the Ashmolean Museum atrium was yet another highlight. The museum caterers seemed to do us proud with canapes and glasses of bubbly, and it was a really good “collegiate” feeling to buddy-up with all the other contenders for the award. Again, the word “contenders” seems to imply we were competing against one another. I certainly didn’t feel like that. We really were ALL winners on the night. We also had the comforting presence of Marte Lundby Rekaa and her expertly-wielded camera. Its great to get professional quality pictures that we can use without restrictions. As I’ve always said – I take snaps, but Marte takes pictures! Some members of the New Writers Scheme may be unaware of the Hessayon name. The late Joan Hessayon was a long-time member of the RNA and a great supporter of the New Writers Scheme. The award is given in her memory, and is sponsored by her husband, Dr David Hessayon. If you have ever been into a Garden Centre, you will have seen his books on display. For many years they have formed an outstanding series of “Expert Guides” and have achieved world-wide sales figures that most of us can only dream of. Just Google Amazon and Hessayon, and you will get a host of results. Those nominated for the Joan Hessayon Award receive a cheque. I have already cashed mine. That’s the Winter Party and almost all my train fare taken care of! RNA parties are ALWAYS worth going to and I can’t think of a better use for the money. Author jjackson42Posted on June 14, 2018 5 Comments on On NOT Winning the Joan Hessayon Award. I’ve been very privileged this week to guest on Charlotte Betts’ Blog. Charlotte is a historical novelist of high esteem! So read, including Charlotte’s part, and sign up for her blog. its worth it. Today on the blog, another author interview – this time from Jay Raven. It’s the first in the “Blood Riders” series and is published by Junction Publishing. 1 What makes a good story? Tension and high stakes, plus a plot that twists and turns, constantly surprising the reader. To maintain suspense, I always aim to start every scene with an intriguing line and end on a hook. 2 How have YOU become a better writer? I’ve learnt to make my chapters and scenes shorter to fit the needs of the Kindle age. These days people want to read in bite-sized chunks – at bedtime, on their daily commute or during a snatched coffee break. In real life, people who are gutsy and positive. Optimism and enthusiasm are infectious. In fiction, protagonists who seek and ultimately achieve redemption. I want someone to root for, who has to battle their inner demons as well as their enemies. 4 What does your family think of your writing? My wife Liz has always been hugely supportive but she isn’t really a fiction fan. (She prefers a good biography). One great thing – if she hates something I’ve written, I know for sure it will sell. 5 What was the most surprising things you learned about yourself in creating your books? I was a short story writer for many years and got it into my head that I couldn’t write anything longer than 4,000 words. Novels seemed an impossible dream, but I’m slowly learning to enjoy the loneliness of the long-distance scribbler. 6 If you could have written any book, what would it have been and why? Billy Liar by Keith Waterhouse. It is witty, subversive, has marvellously comic characters and is packed with sly social and political comment. It’s the book that made me want to be a writer. 7 How much research do you do? Next to none, I have to confess. I’ll check that a certain mode of transport, type of weapon or major event is correct for the period I’m writing about but I take a very Disney-esque approach to history. Everything I write about takes place is a generic “ye olde times”. Wine, watching movies (I used to be a film critic), eating out (I also used to be a restaurant critic) and watching snooker (I’m merely an armchair critic on that!). I can’t relax by reading – it feels like still being at work. I have two habits – I always stop a writing session in mid sentence. It makes it easier to pick up the thread next day. And I always write with earphones on, listening to loudish music. The music plays a twin role, it creates a bubble around me that blocks out any disruptions or distractions, plus helps create an appropriate mood. 10 Why write in your genre? It’s one area of storytelling where the writer has full rein to investigate the darker, hidden and often dangerous side of human nature. I also love the freedom it offers. There are no rules. The only barriers are the limit of your imagination and daring. 11 How is your writing different now from when you started? It might sound odd but my writing has become more visual over the years. I don’t ignore the other senses, but focus more on what characters see and hear. I like to describe their expressions and how their mood or reactions affect the way their eyes flash, darken or squint. It creates the same effect as a close-up shot in a movie. 12 What do people THINK they know about your subject/genre, that they don’t? Many people wrongly think that Gothic horror is old hat and has nothing original to say. They couldn’t be more wrong. I’m excited about how many new angles and elements I’m finding. The genre is constantly evolving and it’s thrilling to put your own stamp on it. 13 Your 3 favourite authors? Terry Pratchett – the master of mirth and human observation. Ray Bradbury – his sci-fi writing is so lyrical it weaves an irresistible spell, magical but also disturbing. Michael Crichton – the creator of Jurassic Park and Westworld – one of the tightest, most economic storytellers in the business. 14 In what ways do you ’service’ or ‘support’ your books? I blog and am shortly launching a newsletter. I’ve just revamped my website at http://www.jayraven.com. 15 If you had to pitch your book in one line, what would it be? Hammer Horror meets High Noon in the lawless badlands of 19th century Transylvania. 16 What makes your book stand out from the crowd? Many writers examine the monsters lurking within ordinary people – I do the exact opposite. I look for the humanity inside my monsters. 17 Tell us something about your road to being published. I was a journalist for 20 years before becoming a full-time fiction writer. It was an excellent training in writing tightly and quickly, and being able to structure a story to immediately grab a reader’s attention. I started by producing comedy twist-ender short stories for popular weekly magazines. I had an amazing stroke of luck in my first week when Chat bought two of my stories for their Summer Special. Plotter, definitely a plotter. My books feature a lot of characters, conflict points and subplots and it’s the only way to keep it all straight. Before I begin I’ll spend a fortnight working out every twist and turn of the narrative in great detail – every chapter and scene, every hook and dramatic opening. I even insert major dialogue exchanges. By the end I’ll have produced a 30-page “treatment” that is a mini version of the novel. 19 Your main character. What makes him or her so special? Anton Yoska, the small town marshal caught up in the battle between vampires and bounty hunters, has a mysterious past that makes people fear and distrust him. He has a strong social conscience and a sense of honour that often works against his own best interests. 20 What question do you wish that someone would ask about your book, but nobody has? Are the film rights still available, and will you take a cheque? Jan, many thanks. Fascinating, and some GOOD answers. Blood Riders is still on pre-order offer at 99p at the time of writing – so be quick!